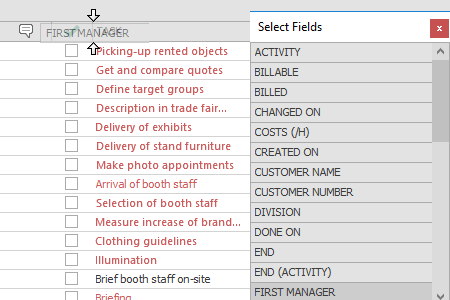 Right-click on the task list and choose Select Fields in the context menu. If you want to add one of the fields to your list, drag it with the mouse into the column header. To remove a field from the task list, drag it with your mouse back into the Select fields dialog. In order to group tasks by certain criteria, drag the field that you want to group by into the Group field above the column headers. When you click on the little arrow next to the group criterion, you can decide whether you want to sort the tasks in ascending or descending order. 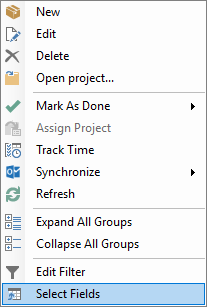 Here, you have again the option to filter the task list: Move the cursor over the group criterion to show a little filter symbol. Click on the filter symbol to narrow down the group criterion. You can also sort the task list by clicking onto the column header that you want to sort by. Click again to change the collation. 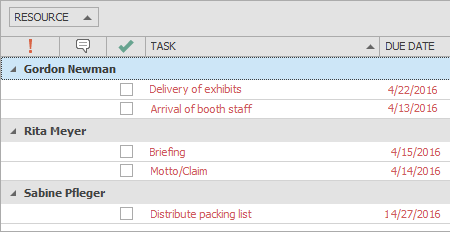 You can also format the task list according to rules that you define by using Conditional Formatting. You’ll find this feature in the Ribbon on the Home tab in the Current View group. Please read the Conditional Formatting chapter to learn how to work best with conditional formatting. Customize the list view | InLoox 9 for Outlook • Copyright 1999-2019 © InLoox, Inc. All rights reserved.